Playing the Rococo Variations in Tchaikovsky’s home city of Saint Petersburg inspired Jan Vogler to record a collection of the composer’s cello works with orchestra. On the album both the Rococo Variations and String Sextet are placed alongside transcriptions for cello and orchestra of the Sérénade mélancholique and Méditation. First on the album is the Sérénade mélancholique originally written for violin and orchestra straight after the renowned Piano Concerto No. 1 in B flat minor. Performed here in Vogler’s transposition for cello and orchestra, the sense of melancholy the cellist creates is deep and profound, whilst maintaining a glorious lyrical feel. Vogler’s engaging playing of the Rococo Variations is both poised and eloquent. The main theme is beautifully underlined by Vogler and I especially enjoyed the second variation a short but lively discussion between cello and orchestra. In variation IIIa Andante sostenuto I was struck by the impassioned tenderness of the soloist in his long and attractive cello line. In contrast Vogler’s interpretation of Variation IV Andante grazioso is blithe, rather childlike and playful. Notable is the score’s conclusion a fresh and infectiously spirited folk-dance. Probably the most popular version of this work is the evergreen account from Mstislav Rostropovich and the Berlin Philharmonic Orchestra under Karajan on Deutsche Grammophon (alternative performances on Alto ~ Regis ~ BBC Legends ~ Brilliant ~ Warner; EMI). Nevertheless the account I turn to most often is the uplifting and characterful performance from Gautier Capuçon with the Mariinsky Orchestra under Valery Gergiev recorded live in 2013 at Paris (review). The Méditation is the first of the Souvenir d’un lieu cher three pieces for violin and piano that Glazunov arranged for violin and orchestra. Here Vogler has transposed the piece for cello and orchestra and gives an intensely moving performance infused with introspection and noticeable impressive control. In the first three works Vogler is accompanied by the Frankfurt Radio Symphony under its new music director Andrés Orozco-Estrada giving impressive support marked by wonderfully unified playing. Throughout the striking timbre of Vogler’s Stradivari Ex Castelbarco/Fau c. 1707 cello sounds full and rich. Tchaikovsky did write other attractive works for cello and orchestra, though they are not recorded here. There is the Pezzo Capriccioso (1887); Andante cantabile in D minor (second movement of String Quartet No. 1, Op. 11, from 1871) arranged by the composer in 1888 and Nocturne (fourth of the Six pieces for solo piano, Op. 19 from 1873) that he arranged in 1888. Instead we have the Sextet for Strings known as the Souvenir de Florence that Vogler describes as “constituting a four movement tour of the Tuscan splendours of Florence.” First sketched as early as 1887 the bulk of the score was written in 1890 following the composer’s return from a holiday in Florence and revised twice before its première two years later. It seems the Sextet was a gift to benefactress Nadezhda von Meck. 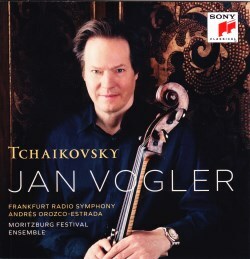 Here Vogler has recorded the work with musicians of the Moritzburg Festival, a chamber music festival, held at Schloss Moritzburg near Dresden. Playing with remarkable sensitivity the engaging performance of the Moritzburg Festival Ensemble feels like a spiritual meeting of minds. In particular I relish the restrained passion of the Allegro moderato and the Finale is compellingly vivacious with a rapid dash to the finish line. Recorded for Sony at HR-Sendesaal, Frankfurt am Main the engineering team has provided satisfying sound clarity and balance.